The federal government announced more $700,000 in grants in Vernon on Thursday. Aug. 17, 2017 12:00 p.m.
A major infusion of cash will keep Vernon area residents moving. The federal government announced $748,519 in Canada 150 grants for four local projects Thursday. “We want to empower communities across the country,” sad Carla Qualtrough, minister of sport and persons with disabilities. The funding includes $150,000 to replace the artificial turf at the VantageOne Soccer Centre. “This is critical to reinvigorate our field. It’s worn out,” said Kai Tolpinrud, soccer centre general manager. The soccer centre allows all ages, but particularly youth, to remain involved in the sport during all seasons. “We’re booked top to bottom most of the year,” said Tolpinrud. There is also $47,019 so the Okanagan Indian Band can renovate facilities at Komasket Park and construct a 1.2-kilometre fitness path. “We want to promote a healthy lifestyle,” said Dan Wilson, band councillor. Ottawa is also directing $80,000 to upgrades to Vernon’s Centennial Outdoor Rink. “It’s great to have families come out and enjoy the facility. It’s important for our youth to get out and be active,” said Akbal Mund, Vernon’s mayor. And the final grant, for $471,500, was announced earlier this year, and it will go towards development of the Okanagan Rail Trail between Coldstream and Kelowna. “We’re looking for ongoing community support and from all levels of government,” said Duane Thomson, with the Okanagan Rail Trail Initiative. 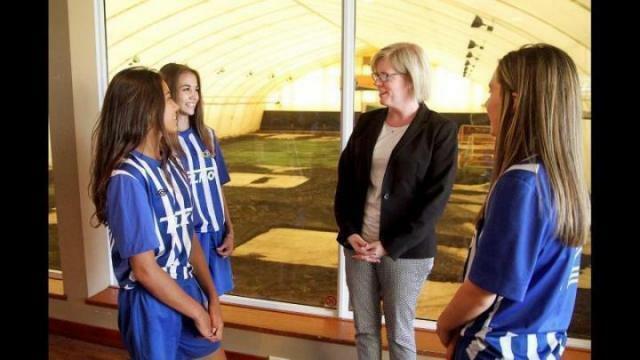 Lisa VanderVelde/Morning Star Carla Qualtrough, minister of sport and persons with disabilities, talks with U13 Vernon United soccer players Nadia Nelson (left), Georgia Wenger and Mia Hyer at the VantageOne Soccer Centre. Visit vernonmorningstar.com for a video of the minister’s Canada 150 funding announcement for four local projects.